Nicholas Hawksmoor's monumental church houses Richard Bridge's equally impressive organ of 1735. This famous instrument was the largest organ in England at the time of its construction. Neglected and out of use for many years, the organ has been stripped of Victorian accretions and restored to its original glory. The work was undertaken by William Drake and Joost de Boer in 20014-15 with Nicholas Thistlethwaite and William McVicker as consultants. Great (GG): Open Diapason, Open Diapason, Stopt Diapason, Principal, Principal, Twelfth, Fifteenth, Tierce, Larigot, Sesquialtra, Furniture, Cornet, Trumpet, Trumpet, Bassoon, Clarion. Swell (Ten G): Open Diapason, Stopt Diapason, Principal, Flute, German Flute, Cornet, Trumpet, Hautboy, Clarion. Choir (GG): Stopt Diapason, Principal, Flute, Fifteenth, Mixture, Quintadena, Voxhumane, Cremona, French Horn. Pedal (GGG): Open Diapason, Principal, Trumpet.. This instrument can be heard in a demonstration by Gerard Brooks on YouTube. CLICK HERE to visit. Video published by Fugue State Films. The unique French Horn stop can be heard in a demonstration by William Whitehead. CLICK HERE to visit. This important historic organ was built for the Chapel Royal, Windsor, in 1704 by 'Father' Bernard Smith and moved to Finedon by Christopher Shrider (son-in-law of Father Smith) in 1717. One of the earliest three-manual instruments in Britain, the original 'Echo' division spoke out through a grille above the console. Although the organ received new soundboards, action and console from G.M.Holdich in 1872, it retains its fine case, original stop-jambs and 11 stops of original Smith flue pipes. 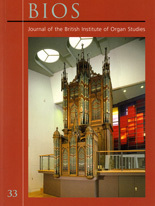 The organ was restored by Holmes & Swift in 2014. Great: Open Diapason, Stop'd.Diapason, Gamba, Principal, Twelfth, Fifteenth, Sesquialtra, Trumpet. Swell Open Diapason, Stop'd.Diapason, Principal, Fifteenth, Echo Mixture, Horn..
Choir: Stop'd.Diapason, Dulciana, Principal, Flute, Fifteenth. Pedal: Open Ped. Pipes, Bourdon Ped. Pipes. This instrument is notable for being the most complete organ surviving from the Gray Brothers' workshop, most having been rebuilt. Dating from 1795, it has a second manual added in 1844 by the then newly-founded firm of John Nicholson. A paper found inside the Swell organ soundboard was an advertisement for W.H.Elgar (Sir Edward Elgar's father), then a newly established local piano tuner. The organ was restored in 2010 by Goetze & Gwynn. Great: O.Diapason, S.Diapason, Dulciana, Principal, Twelfth bass, Twelfth treble, Fifteenth, Sesquialtra bass, Cornet treble. Swell Bourdon, Open Diapason, Stop.Diapason, Principal, Fifteenth, Oboe. CLICK HERE for a video of the restoration project by JDA Media, with demonstrations of the organ before and after restoration. Abraham Jordan built an organ in 1723 for the church of St George, Botolph Lane, City of London. The case is the first of a series of fine early eighteenth-century organ cases made by a specialist Clerkenwell cabinetmaker. The organ was moved to St George, Southall, in 1907 when the Botolph Lane church was demolished. The organ received a new action and a new Swell organ soundboard at that time. The organ was restored by Mander in 2009 with a new action and wind system, together witrh replacement lower panelling and an eighteenth-century-style console. Great: Open Diapason, Stopt. Diapason, Principal, Twelfth, Fifteenth, Sesquialter, Cornet, Trumpet bass, Trumpet treble. Swell (Tenor C) Op.Diap, Stopt.Diap,. Principal, Trumpet. CLICK HERE for a workshop demonstration of the organ by William McVicker with John Mander blowing the organ by hand. The Henry Cephas Lincoln organ in Thaxted Church is the earliest surviving English church organ that retains all its original parts. It was built for St.John's Chapel, Bedford Row, London in 1821. When that chapel closed it was moved to the north transept of Thaxted Church in 1858. It was little repaired or altered and, although failing, was recorded for the BIOS Historic Organ Sound Archive. It was restored in 2014 by Goetze & Gwynn. The organ now looks, sounds and plays as it did in 1821. Great:: Open Diapason Front, Open Diapason, Stop'd.Diapason, Principal, Twelfth, Fifteenth, Sesquialtera (bass), Cornet (treble), Mixture, Trumpet. Swell: Open Diapason, Stopt.Diapason, Principal, Trumpet, Hautboy, Cremona. Choir: Stop'd.Diapason, Dulciana, Principal, Flute, Fifteenth, Bassoon. This instrument can be heard in a demonstration by Gillian Ward Russell on YouTube. CLICK HERE to visit. 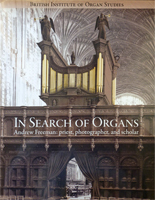 Video made for the Cambridge Academy of Organ Studies. The restoration works outlined above reflect the restoration principles encouraged by BIOS but were not the responsibility of BIOS itself.